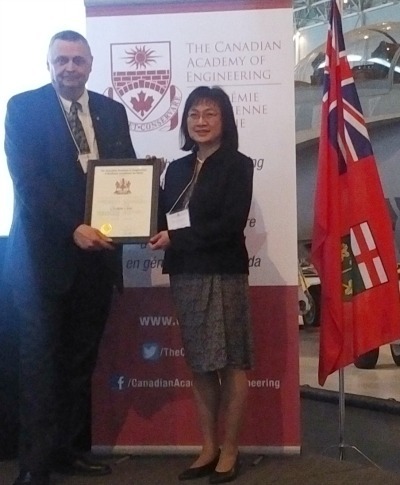 By Costa Maragos Posted: June 28, 2017 7:00 a.m.
For the third year in a row, a professor from the Faculty of Engineering and Applied Science has been inducted as a new Fellow in the Canadian Academy of Engineering. Dr. Christine Chan, Professor and Canada Research Chair (Tier 1) in Energy and Environmental Informatics, is one of 52 Fellows from across Canada to receive the honour. A ceremony was held in Ottawa June 26, 2017, at the Canadian Academy of Engineering’s annual meeting. Chan has become the first female Fellow of the Academy at the University of Regina. The Canadian Academy of Engineering is an independent, self-governing and non-profit organization established in 1987. The Academy is a national institution through which Canada’s most distinguished and experienced engineers provide strategic advice on matters of critical importance to Canada. In 2016, the U of R's Dr. Paitoon (P.T.) Tontiwachwuthikul was inducted as a Fellow. In 2015, Dr. Gordon Huang, also of the U of R, received the same honour.